For our third installment, we bring you our conversation with Dr. Michael Mann, Director of Penn State University’s Earth System Science Center, Distinguished Professor of Meteorology and one of the world’s foremost climate scientists. But it is a metaphorical “hockey stick” that mosts intrigues GreenSportsBlog about Dr. Mann. We are referring to the shape of the graph of the historical earth temperature record going back 1,000 years that shows modest changes until the post Industrial Revolution era when temperatures spiked upwards. GreenSportsBlog spoke with Dr. Mann about climate change, hockey and more. GreenSportsBlog: “An Inconvenient Truth,” Al Gore’s 2006 Oscar®-winning documentary film was highlighted by your temperature hockey stick!! That is so cool! We will get to hockey sticks and Congress’ attempt to put you in the climate change penalty box in a bit. Before doing so, I guess I’d like to know how you came to climate science. Dr. Michael Mann: I came to it circuitously. Growing up in Amherst, MA, while I did like sports—I ran cross country, played basketball, loved the Larry Bird-Kevin McHale-Tiny Archibald Celtics—I was really your basic math nerd, hanging out on Friday nights with other math/computer nerd friends. GSB: Sounds like a blast! MM: …Indeed. And then I went to UC Berkeley and studied applied math and physics. GSB: What is applied math anyway? MM: It’s geared towards solving real world problems rather than theoretical ones. Then I went to Yale for graduate school to study physics. But, mid-degree, I wasn’t excited about the problems I was being given to solve. So I looked at Yale’s catalogue of scientific research to see where I could use what I had learned to work on a big problem with real world significance. And I found geology and geophysics, which uses math and physics to model the earth’s climate. This was very interesting to me. GSB: Which is a very good thing for climate science! GSB: Did you live at home with the folks? MM: In fact, yes, I did, I lived in an attic apartment in the house. It worked out quite well, actually. And it was there that my interest got piqued in climate change. We worked to use paleo-climate data to extend the climate record, which, at the time, extended to only a century of thermometer-based information. GSB: Is that where you looked at tree rings? MM: Exactly! We used tree rings and coral records and other so-called “proxy” data; natural archives that record past climate conditions, to extend back in time our knowledge of global temperature changes. By 1998 we we were able to go back 600 years; by the next year, we were able to extend the record back in time 1,000 years, a millennium. GSB: And what did you find? MM: That the earth’s temperature rise since the onset of the Industrial Revolution was unprecedented, as far back as we could go. I was the lead author of the article in Nature, published on Earth Day—April 22, 1998—that introduced the “hockey stick” curve and demonstrated the unprecedented nature of the recent temperature spike. GSB: Did your research also include data going back hundreds of thousands of years on atmospheric CO2 concentrations? MM: The CO2 records, collected from ice core samples, already existed. What was new from our work was the temperature data. And of course it showed a remarkable synchronicity with the already existing CO2 information. It showed that temperatures rose when CO2 in the atmosphere rose. What’s most worrying now is, that CO2 levels are off the charts and temperatures are still in the process of rising in response. GSB: Believe me, I’m well aware of that from seeing the hockey stick in “An Inconvenient Truth,” and from being a volunteer Climate Reality Leader—I, along with thousands of other everyday citizens from all over the world, have been trained by Al Gore and his staff to give the slide show that was at the heart of his Academy Award® winning documentary to community groups in their own neighborhoods. The “hockey stick” played a key role in the slide show to be sure. Speaking of the “hockey stick,” did you come up with it yourself? MM: Actually, the hockey stick term was coined by a colleague at Princeton who’s no longer with us by the name of Jerry Mahlman. Because sports analogies and metaphors are so powerful, this framing seems to have clicked with the public, but I have been surprised how strong the click has been. I think the imagery is particularly powerful in Canada—no surprise there. 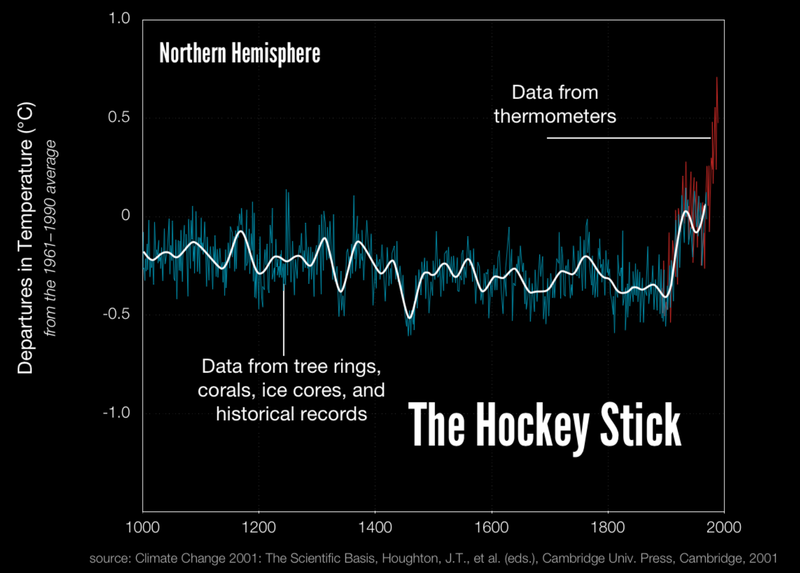 Basically, the “hockey stick” became shorthand that conveys the severity of human-caused climate change. MM: Yes. Sometimes people ask the wrong questions when it comes to climate change—for example, was hurricane Katrina caused by climate change? That’s like asking whether the 68th home run hit by Barry Bonds in 2001 was caused by steroids. We can never answer that question. But we can conclude that collectively, many of his home runs were due to the steroid use, just as we can conclude that the increased occurrence of devastating hurricanes is due to human-caused climate change. GSB: And couldn’t you also say Barry Bonds would hit the ball that turned out to be his 68th home run no matter what. But, due to steroids, some portion of that ball’s journey was enhanced by steroids use. MM: Exactly! And, listen, I also want to bring football into the discussion. Not long ago I saw the movie “Concussion.” It is the perfect analogue to climate change denial. MM: Well, the NFL’s denial of the link between pro football-related concussions and brain related diseases like CTE^ despite knowing the science says the opposite is analogous to the fossil fuel industry denying the reality and seriousness of climate change even though it knows full well the solid science behind it. GSB: You can add that certain members of Congress, funded by the fossil fuel industry to spout climate change denial, are like refs paid by gamblers to fix games. MM: Of course. Look, I’m a scientist and a communicator. You cannot be an effective communicator without recognizing the power of sports—it’s so engrained in our culture—it would be a lost opportunity if you didn’t use sports analogies and metaphors to drive home your points. GSB: You’ll get no argument from me there. Now, back to “Concussion”: In the movie, Will Smith played Dr. Bennet Omalu, the Nigerian-American pathologist who discovered the link between concussions and CTE and who thus had to face the wrath and weight of the NFL. 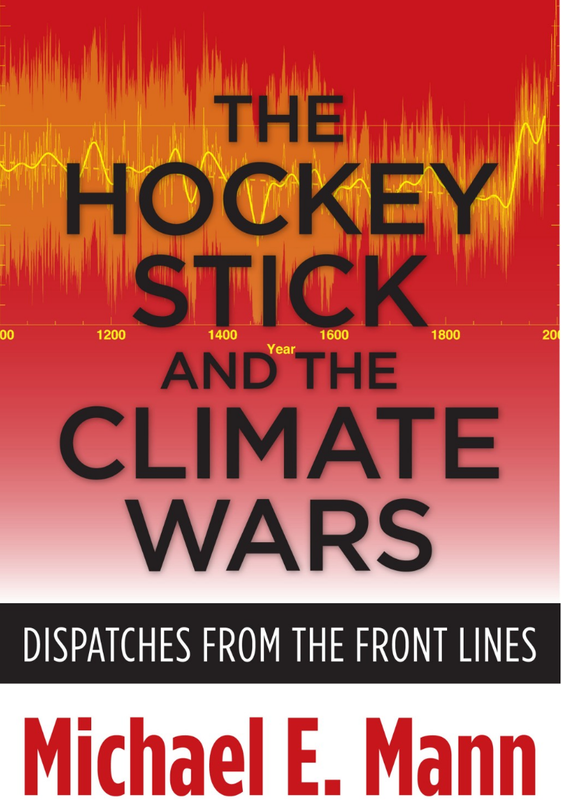 Since you have been grilled by hostile members of Congress—as detailed in your 2012 book from Columbia University Press, “The Hockey Stick and the Climate Wars,” and your research and funding has been challenged by them, are you kind of like the Omalu of climate change in the USA? MM: I’ll take that comparison any day. And, while it’s certainly not fun to have your work demeaned, challenged and picked at in public, I can handle it. You see I want the ball at the free throw line, down one point, with two foul shots and no time on the clock. Because the climate change fight is one game we have to win and I want to be a part of winning it. GSB: Somehow I see you making those free throws! Ed. Note: Dr. Mann’s upcoming satirical book, “The Madhouse Effect: How Climate Change Denial is Threatening Our Planet, Destroying Our Politics and Driving Us Crazy, co-authored by Pulitzer Prize-winning political cartoonist Tom Toles and published by Columbia University Press, will go on sale in September and is available for pre-order now.